GERMANY: The energy regulator has granted contracts for 709MW of wind projects at a weighted average of €46/MWh. Eighty-three successful bids were made for wind’s allocated 700MW, with a total capacity of 709MW eventually being awarded. The 700MW initially advertised was slightly oversubscribed, the regulator Bundesnetzagentur (BNA) stated, with 132 bids being made for a combined total of 989MW. Lower Saxony accounted for the most successful submissions, with 17 winning bids for a total of 154MW. Brandenburg (13 projects for 106MW), North Rhine-Westphalia (12 sites for 61MW) and Rhineland-Palatinate (11 projects for 124MW) had the next highest number of winning proposals. Successful bids ranged from €38/MWh to €52.80/MWh, with an average of €46/MWh, the BNA stated. This price range is up slightly from November’s tender, when bids varied from €22/MWh to €38.20/MWh. Of the 83 projects, 19 were citizen energy companies, according to the BNA, accounting for about 22% of the winning bids. This figure is down from the last auction in November, when citizens’ projects made up 98% of the 61 successful submissions. In the old system, citizens’ projects received the €38.20/MWh upper limit under Germany’s auction rules. Community projects’ 98% of winning bids in November pushed the weighted average price up to the €38.20/MWh upper limit. But following the last tender, the BNA scrapped rules deemed advantageous to community projects for auctions taking place this year, however. This included removing concessions allowing citizens’ groups to bid for projects not yet permitted and granting them a 54-month implementation period — two years longer than the 30-month window for larger developers. The German Wind Energy Association (BWE) said the latest auction was the first to achieve "fair competition". BWE President Hermann Albers added that all proposed projects needing approval before bidding was a positive change, and that the policy needed to remain. "This will give the players the necessary security and will secure sufficient liquidity in future bidding rounds," he said. WindEurope CEO Giles Dickson agreed that rule changes ensured "fair competition between all bidders" and argued consistency was needed in future tenders. "The new German government needs to apply uniform rules to all projects in subsequent auction rounds, including for the additional 4GW that’s envisaged in the coalition agreement," he said. "Last year’s auctions are likely to cause a slowdown in new installations, and some of the projects may not happen. This will hit manufacturers and others in the supply chain." He added: "Germany also needs to look at the regional balance of onshore wind. 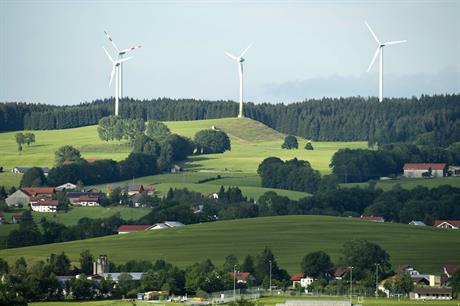 "It would be good to see the southern Bundesländer (German states) contributing more to the expansion of wind energy and benefitting from the economic and social benefits wind energy brings to communities. "It would also help from a transmission point of view." Meanwhile, solar projects, bidding in a separate, concurrent tender in February, came in cheaper with a weighted average price of €43.30/MWh. The two technologies will ‘compete’ against each other in a joint tender for 200MW to be concluded in April, the BNA announced this week.